You are here: Home / Restaurant / Gaucho celebrates the National Chocolate Week – with wine of course! Gaucho celebrates the National Chocolate Week – with wine of course! Gaucho is a place I have visited many times. I say ‘a place’, but there are 14 around the UK, and each one has a slightly different feel, from the amazingly hospitable staff at Gaucho Smithfield to the incredible wine displays at Gaucho Tower Bridge. 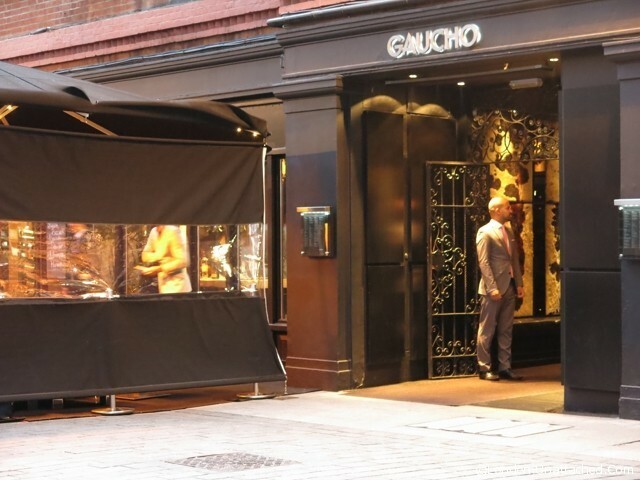 So it was a great pleasure to receive an invite to the launch of Gaucho’s chocolate menu and matching wine tasting. 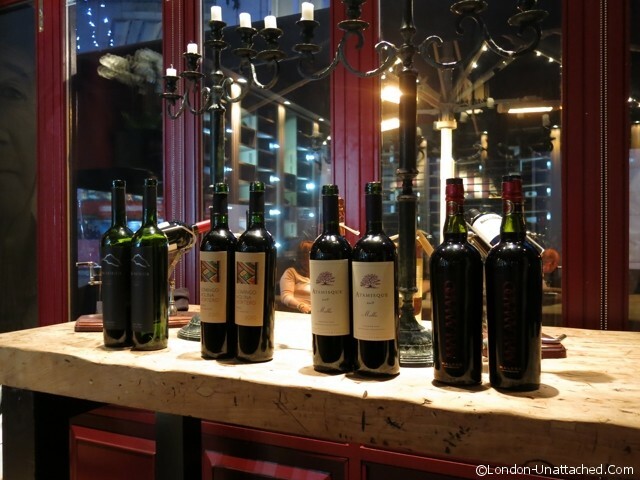 The tasting was at Gaucho Piccadilly, a truly upmarket location, just off Regent Street. I have been here before and it never ceases to amaze me how comfortable and at ease they make you feel. Ideal after a days work or for a special night out. 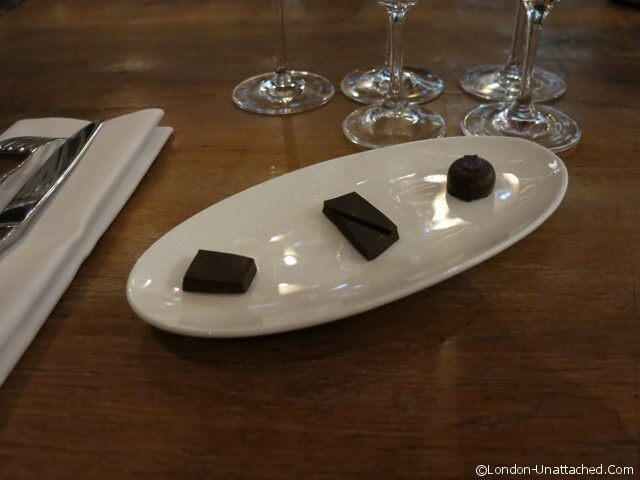 Set in a private dining room, the chocolate and wine matching started with a plate of 3 chocolates. A regular 70% dark chocolate chosen to highlight the classic match between Malbec and chocolate. The bitterness of the high cocoa chocolate is countered by the sweetness of the tannins that Malbec is so famous for. A coffee and vanilla chocolate was selected to extract the oak influence of the Vina Patricia Malbec. Similar to the first chocolate the fat and proteins from the chocolate soften the wine leaving a silky and velvety texture on the pallet. This was the most controversial choice of chocolate – violet flavoured chocolate. Malbec is extremely well known for its floral characteristics with violets always present. It highlighted the Malbec’s ability to tone down the strength of the chocolate whilst the chocolate lifted the floral side of the wine. That’s said, it is not your normal chocolate and is used to show how even extremes can work together. Groups of up to 14 can attend the Malbec and Chocolate Masterclass – available from Monday 14th – Friday 18th October at Gaucho Piccadilly. Head Sommelier Zack Charilaou will teach chocolate lovers how the bitter taste of their most loved indulgence is enhanced by the deep, smooth flavour of Argentine Malbec. Likewise, wine and Malbec lovers can realise how they can really compliment and enhance the choice of chocolate at the end of a meal. Priced at £30 per person it is well worth investigating. After the wine and chocolate matching, and having really seen (and tasted) how wine and chocolates can enhance each other, we started with the meal. 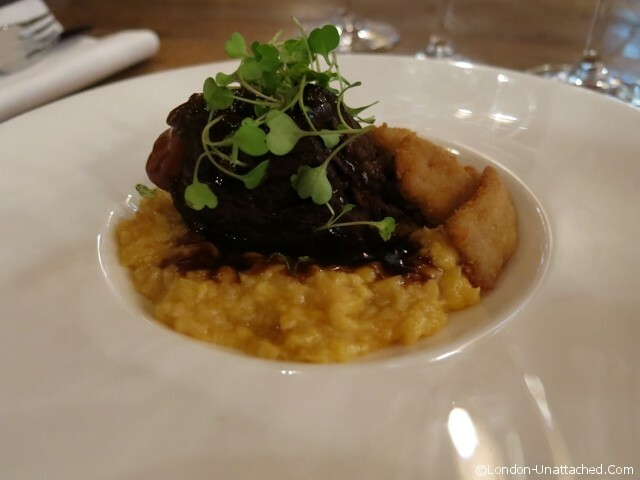 The starter was Braised beef cheeks with lamb sweetbread popcorn in almonds and breadcrumbs, humita and chocolate jus, and this was paired with a Molina Moreno Malbec produced in the Salta region of north-west Argentina. Salta is situated at 2000m above sea level and is known for producing very rich, intense and full-bodied Malbecs. Humita is a crushed sweet corn mash, which is very typical of the Argentinian country food. The first dish was the richest of the three dishes served which required a Malbec with similar qualities to compliment the dish. 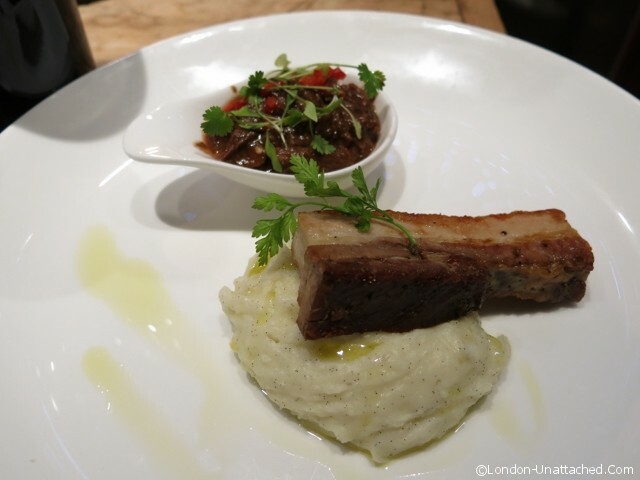 The main dish was a trio of pork: slow cooked pork belly, white chocolate and vanilla mash, braised mole pork matambre and crispy chocolate crackling. This was matched with an Atamisque Malbec from a region called the Uco Valley in Mendoza – Argentina’s largest wine producing region. The white chocolate in the food worked well with the oakiness in the wine, and was, without doubt, the favourite dish amongst the diners on the night. The mash was interesting; it tasted fine, stimulating the taste buds, but with a background flavour that left all confounded. Like a cross between vanilla and cream, you would have been hard-pressed to know it had chocolate in it. And therein lies the magic of using such different ingredients in food; everyone loved it, but no one expected to. 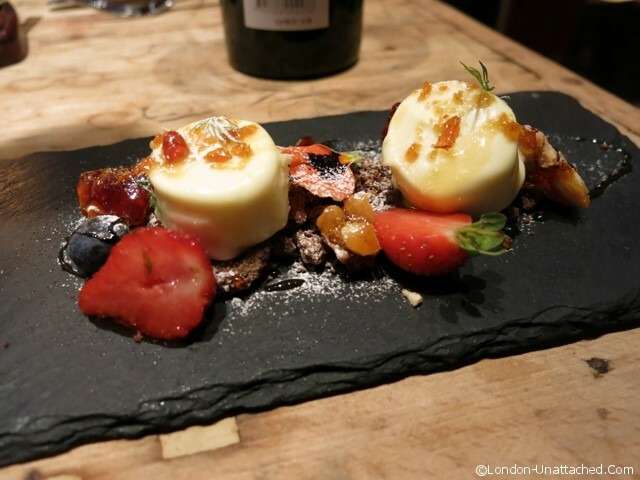 For dessert, a white chocolate mousse with milk chocolate crumble, fresh and frozen fruits and almond praline. This was a beautifully presented dish, full of the soft dessert flavours you want to wrap up a rather meaty meal with. It was accompanied by a Zuccardi Port Malbec, which is much lighter than a dessert wine, yet sweeter than a traditional port, and of al the wines sampled, this one caused the most discussion. 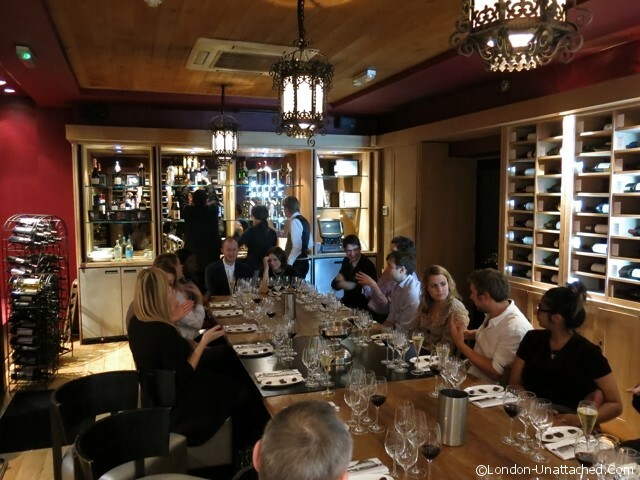 The meal was unhurried, the interaction between Gaucho experts and customers was friendly and informative, and the structure was flowing and comfortable. It is one I would do again, both for the wines and the food. The Chocolate Menu is at all 14 Gaucho restaurants in London, Manchester and Leeds, and they all will be celebrating National Chocolate Week during 14th – 20th October 2013. I would book now as this is one tasting menu not to be missed. Fantastic descriptions! I woud love to do a similar wine & chocolate pairing so as to assess whether I am able to draw out the flavours that you expressed experiencing! Then again, violet chocolate is reason enough even should the wines not be available! Truly though, beautiful recommendations! You are one lucky lady Fiona!! Mousse and crumble wins the presentation prize..How deeply gourmet …This might be outside my range since chocolate is not really my kind of sweet, but the class must be very intriguing.